I have been wanting to make this dish ever since I saw Bend It Like Beckham (especially after watching the director get her hands dirty in the kitchen). Following our spice investment this weekend and a one-week old cauliflower (it was only 98 cents!) sitting in the fridge, we decided to give this dish a go. It is simple and cooks quite quickly. 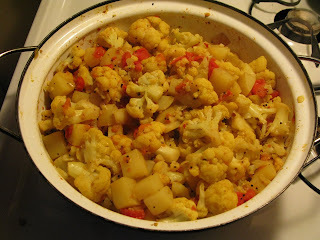 I think we put more vegetables (especially potatoes) than the recipe suggested, could have ramped up the spices a bit but it is delicious just the way it is. I think it will even be better the next day, giving the potatoes a bit more time to soak up the flavours. Heat the oil in a deep, heavy-based frying pan over low heat. Add the mustard seeds, cover the pan and wait for the seeds to pop. Add the onion and potato and fry until lightly browned. Add the turmeric, cumin, coriander and garam masala to the pan and fry for a couple of seconds. Add the tomato and stir until the spices are well mixed. Add the cauliflower florets and stir until well mixed. Stir in the ginger, sugar and 125 mL (1/2 cup) water, increase the heat to medium and bring to a boil. Reduce the heat, cover and simmer for 15 minutes, or until the vegetables are tender. Season with salt to taste. Uncover the pan and if the sauce is too runny, simmer for 1-2 minutes before serving.